James Foley, the American reporter beheaded last week, shared a prison cell with former Belgian fighter Jejoen Bontinck for at least three weeks. Reportedly, they were held at that time by Bontinck’s former comrades from Shariah4Belgium, who brandished Jejoen as a traitor because he wanted to go home. It was CEO Philip Balboni of GlobalPost, the American news site for which Foley was working in Syria, who broke the news about his deplored journalist and Jejoen Bontinck knowing each other. “In September 2013, a young Belgian who had travelled to fight in Syria had befriended Foley and, once that jihadist went back to Belgium, offered excellent information on roughly where Jim was held and by whom”, he was quoted by NBC News. “It was the first time we knew that Jim was alive. It was a wonderful, wonderful moment.” Balboni didn’t mention the name of the Belgian — but that wasn’t hard to find for anyone familiar with the phenomenon of Belgian fighters in Syria. Jejoen Bontinck (19) went to Syria in February, 2013. He converted to islam a few years before and joined the radical organization ‘Shariah4Belgium’. He says he didn’t want to fight, but provide humanitarian assistance to the Syrian people. Disgusted by the violence of war, he wanted to go home already in March of that year. But his comrades from Shariah4Belgium with whom he teamed together, considered him as a traitor or even a spy, and imprisoned him for several months. He was held in Aleppo, the northern Syrian city which was the main stronghold of the radical islamic resistance at that time. Bontinck was never a prisoner of the Islamic State, his lawyer Kris Luyckx explained to the Belgian newspaper ‘Het Laatste Nieuws’. Although most of his Belgian comrades now have joined the extremely brutal group, at that time they were still active under the banner of ‘Majlis Shura al-Mujahideen’ or ‘Jabhat al-Nusra’. That Bontinck was held together with Islamic State victim Foley — as confirmed by Luyckx — is consistent with the claim that Foley’s abduction was carried out by of one of those groups. When the American got caught in November 2012, the Islamic State didn’t exist yet in Syria. It was founded in April 2013 as ISIS — the ‘Islamic State in Iraq and Sham’. “Bontinck and Foley shared a cell for at least three weeks around August of last year”, says Luyckx. “And they weren’t the only Westerners — there was a European journalist too. Apparently, the two reporters were later transfered to ar-Raqqah, and it must have been there Foley was held by the British fighters that are known now as ‘The Beatles’. Jejoen has never met the guy who killed Foley or one of his accomplices. He always stayed in the hands of his former comrades of Shariah4Belgium.” If that is true, it means that Foley too was held by the Belgians for some time. It isn’t clear whether they were also involved in Foley’s abduction — and an important question that also remains, is whether it were Bontinck’s former brothers in arms who have delivered Foley directly to those who’ve killed him now. The Belgian judiciary has indicted thirteen people for taking Bontinck hostage — based on the names he reportedly mentioned himself — and at least some of those people can be suspected in Foley’s case too. All belong to a group of 46 that has to stand trial this fall — although for most of them it will be a trial in absentia, since they are still fighting in Syria or were killed in action there. Of the thirteen former Shariah4Belgium members that are indicted for imprisoning Bontinck, at least four have died already: Houssien Elouassaki from Vilvoorde, Nabil Azahaf from Brussels, Noureddine Abouallal from Antwerp and Yassine El Karouni — a Dutchman that apparently has spent most of his last years in Antwerp. Of those who are considered still alive, the highest ranking is Hicham Chaïb, alias ‘Abu Haniefa’. He became one of the leaders of Shariah4Belgium after the imprisonment of it’s founder Fouad Belkacem. 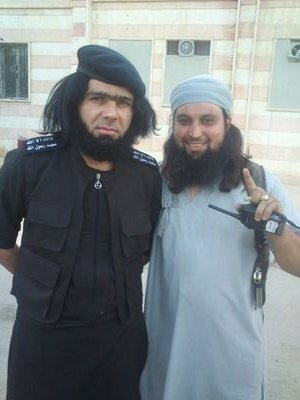 Chaïb is living in ar-Raqqah now, where he was seen already in the company of senior Islamic State commander Abu Waheed. 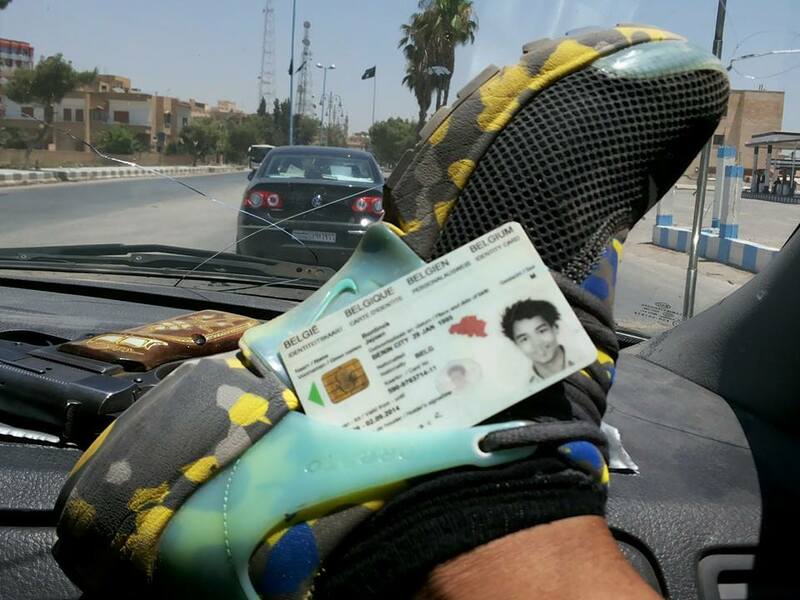 The remaining eight names are Azeddine Kbir Bounekoub, Said M’Nari, Brahim El Mimouni and Fouad Akrich from Antwerp — Zakaria Asbai and Magomed Saralapov from Vilvoorde — Rachid Iba from Maaseik — and Redouan Akdim from Naarden in the Netherlands. Noteworthy is that Iba was already convicted as a member of the terrorist ‘Groupe Islamique Combattant Marocain’ back in 2006, that Kbir Bounekoub has appeared in a gruesome video with dead bodies in Syria, and that Akrich is one of the exceptions who stayed in the ranks of Jabhat al-Nusra — a fact that has ignited already vicious debates on Facebook, where he’s still a ‘friend’ of his former comrades who went to the Islamic State. Jejoen was freed in September 2013 and after his return in Belgium, he was intensively interrogated by security services of several countries. According to his lawyer, the information he provided about the location where he and Foley were held, has been the motor behind the rescue operation undertaken for Foley by American elite soldiers. But the details Bontinck gave about his prison — “near a courthouse and a hospital”, for instance — were about the place where he was held in Aleppo. And apparently the raid took place at a time Foley was moved to ar-Raqqah already.